So you have finally set the final date for the wedding day. Now it’s time to let your loved ones hear the good news through an engagement party. Whether you are planning a dazzling formal party with ball gowns and tuxedos or a casual, laid-back gathering on the beach with lightweight, flowing attires, you need to approach your engagement party preparation meticulously. So if you are the one engaged or anyone who is charged with the burdensome responsibility of throwing an engagement party, then you must know how important the gastronomic segment of the party is. 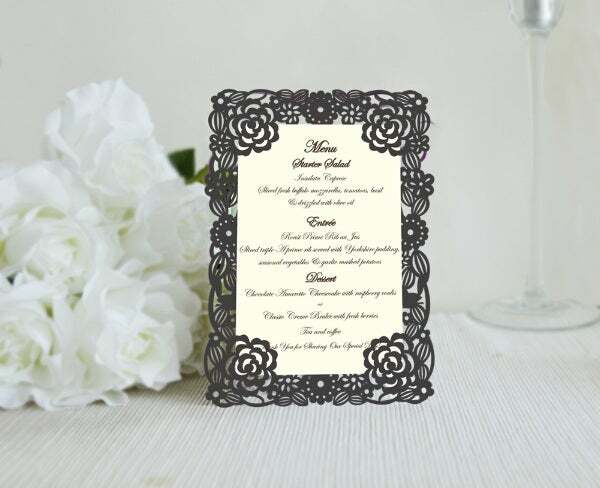 And if you are looking for ways to make your guests enjoy the party while eating, then it is advisable that you present each table or each one of them with a specially designed party menu. Want ideas how to make one? 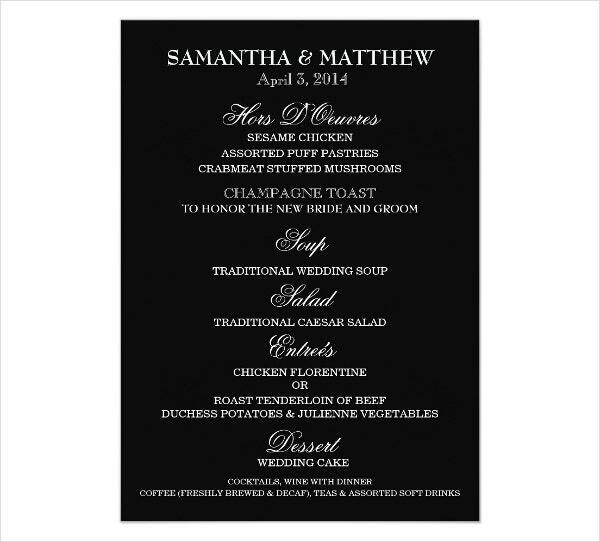 Here at Template.net, we offer you with a variety of classy engagement and Wedding Menu Templates for your convenient use. An engagement party precede the big tying-of-the-knot day, and it is, for some, a necessary prologue of the wedding day to come. Engagement parties are quite taxing affairs to prepare for, not to mention extremely costly. Hence, as the party planner, you must try to be economically smart about your expenses and be keen on saving up whenever you can. Need any help in planning your party? Below are some tips for your guidance. A theme may not necessarily be formal and apparent in an engagement party. but you need to at least have a basic design scheme so it will be easier for your party decorations to have a cohesive appearance. 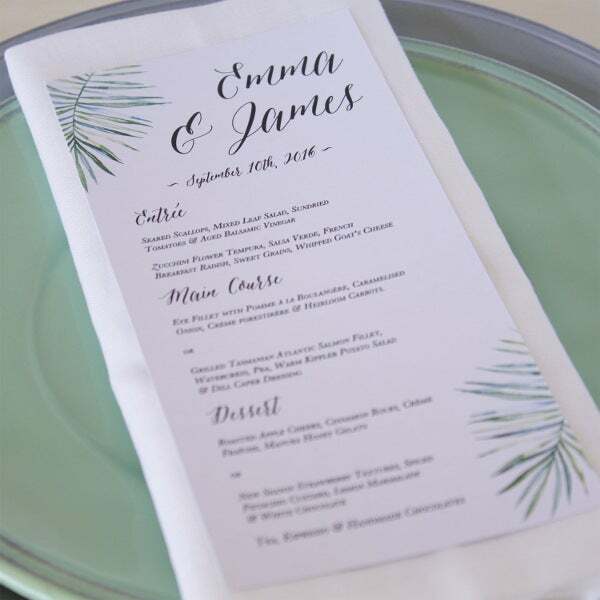 While it is always safe to revert to the classic gourmet items, your guests will have more fun if you choose a cuisine which the engaged couple are known to enjoy. If the engaged couple are famous for their taco obsession, then by all means, serve Mexican food like tacos, chili con carne, guacamole, and quesadillas. Of course, you have to make sure that the cuisine chosen will coordinate with the party’s theme and location. 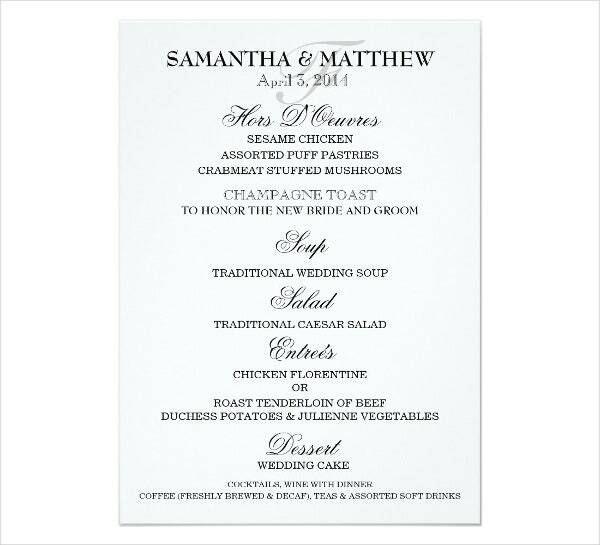 After you’ve chosen a cuisine, finalize your party menu. 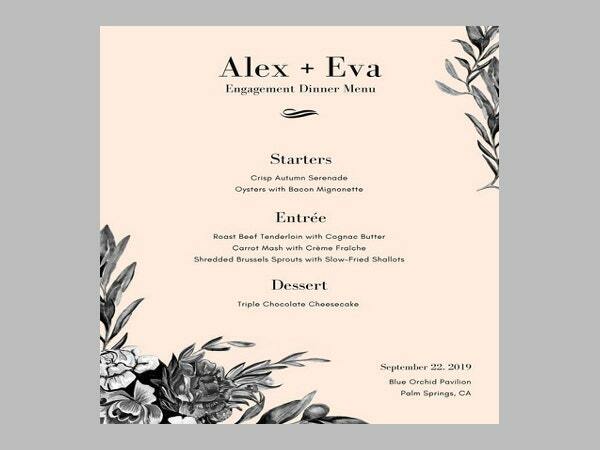 Afterward, it is time you select a design for you menu. 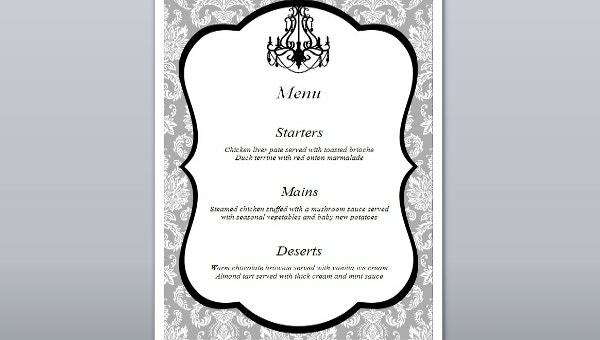 When designing the menu, make sure that you don’t overcrowd it with too much food choices. Remember, you are serving a party of people where most of the time your manpower, chefs, and supply of produce are limited as compared to a real restaurant. Also, make sure you prepare varying classes of food. No matter what cuisine you are serving, there has to be a variety (e.g., fish, poultry, beef, appetizers, soups, salads, and desserts). 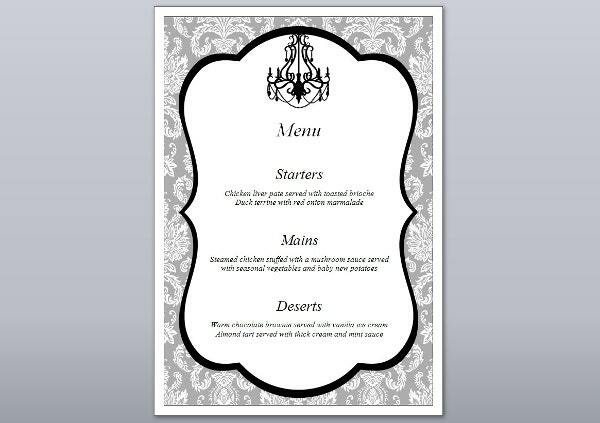 Lastly, don’t forget to make it easy for your guests to browse your menu by placing headings in huge fonts above each category of food. After all your planning is done, make sure you send invitations two to three weeks before the party and don’t forget to match your invites to the rest of your party’s theme. 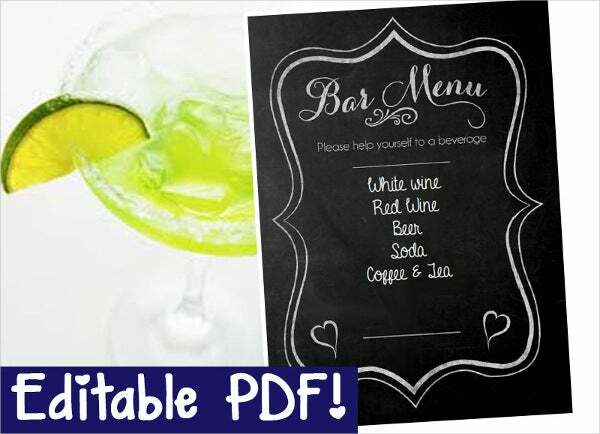 Now that you know the basics, why don’t you download one of our Elegant Menu Templates and start making your party’s menu now.